This is one of the essential flavor pillars which will enhance almost any dish be it soup, stews or sauces. It can also be a side dish all by itself. Onions when caramelized are actually sweet and super fragrant. Takes a bit of patience but its worth it. First remove a bit of the top and bottom of the onion. Then halve the onion length wise. (back to front) Doing this gives you an ‘anchor’ (the bottom stem where the roots originate from) that prevents the onion from falling apart when you dice the onions. Make 4 to 5 vertical cuts from back to front but leave a bit of the back stem in place. Make 2 to 3 horizontal cuts from front to back but again leave a bit of the back stem. Now slice the onion downwards as finely as you can manage. Just in case you are tempted to do this fast ala the TV chefs, I advise you to take it nice and slow. Over a medium heat, add a 2 second pour of olive oil in a heavy bottom pot and add the onions stirring to coat the onions thoroughly with the oil. Try to spread the onions evenly over the base of the pot before covering the pot with the lid. Stir every 3 to 5 minutes. After about 15 to 20 minutes, the onions will have softened, turned translucent and started to brown.When the onions turn medium brown, add just a pinch of salt, turn the heat off and set aside. 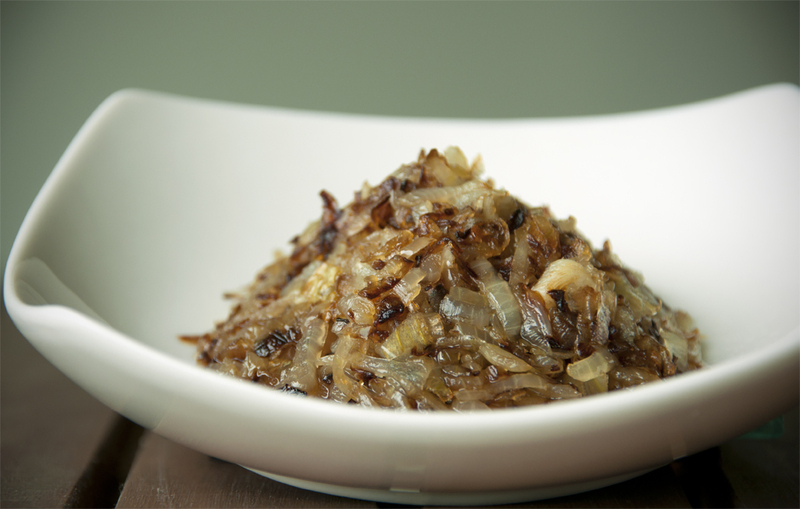 This entry was posted in ESSENTIALS (Basic Items) and tagged browned, caramelized, onions by Whisky Uncle. Bookmark the permalink. My grandmother used to add chilli Padilla and pinch of light n dark soy sauce. So gd u can eat it on it’s own – Mel.